I have an annual review coming up in April. I know this because I called the hospital a while ago to check I was still on their list (I recently transferred back, having been seen at my GPs for a few years). I also know it because my blood glucose levels have been running stupidly high recently. This seems to happen to me a lot. As soon as I know I'm in the 3 months running up to the test (HbA1c gives an indication of average BG levels over the last 3 months) it all goes to pot. I've come to think of this as 'HbA1c Phenomenon'. Weekly averages recently have been in the mid 8's. I haven't been doing this badly for about 8 months. I was so hoping for a good A1c. Almost as an 'official' affirmation of the work I've been putting in. Secretly I think I was hoping I'd make it into the elusive 5% club (sub-40 in new mmol/mol numbers), but now I think I'll be lucky to match my last one of 7.1%. If I was still pottering along without paying much attention I'd be happy enough with that (as indeed I was), but when you are working much harder at something it's nice to see some sort of results, and a little frustrating to think that you would have seen those results a month or two ago when you didn't have the test scheduled! In my heart I know that the HbA1c is a pretty poor indicator of control. I've cheated low numbers before by having enough hypos to cancel out all the highs. But it's the badge which defines you as far as the medical profession is concerned. However inaccurate it is, it's still considered the 'gold standard' indicator. I wanted not only to have better control (which I do) but to have a pleasingly low A1c to match. So I am trying (and largely failing) not to get too grumpy about this. To breathe deeply, take one test at a time and be happy with how far I've come in the last 12 months. You never know... the test is weighted to the most recent 4 weeks or so. I might still have a chance to knock a bit off if I can keep my head during March. 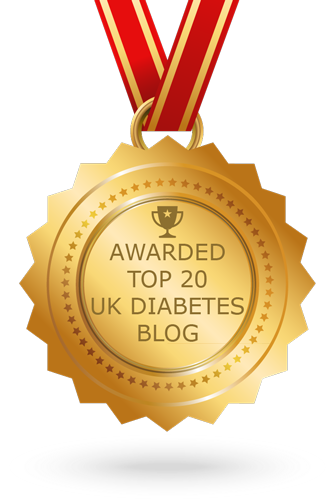 I was asked by Diabetes UK to write a guest post for their shiny new blog blogs.diabetes.org.uk. I wrote it just around the time of this blog's 1 year birthday, and unsurprisingly it became a sort of 'looking back over the last 12 months' thing, a variation of the themes on which I posted here a week or so later. If you are interested, you can read it on the Diabetes UK blog here: "I still love my pancreas and other things I have learned this year". It doesn't matter if this is the first blog post you've read or the thousandth. Whether you comment on diabetes forums the world over or lurk in the background of just one. The Diabetes Online Community is so much greater than the sum of its parts, and by reading this, whether you are diabetic yourself or just know someone who is (and frankly these days that is pretty much certain) you can now count yourself an official member of the D-OC. I'll pop a badge in the post to you. Get yourself a 'Blunt Lancet *' tee and wear it with pride. 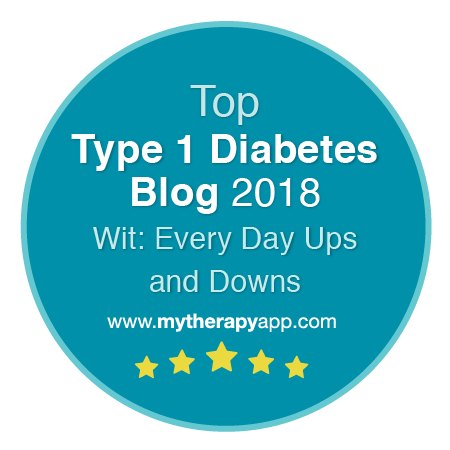 As Jane wrote on Friday, this weekend is the anniversary of the unfortunate incident that triggered the birth of this blog and my discovery of the support, wisdom and hilarity to be found among online diabetics. You have helped me to turn a corner with my diabetes. And I didn't even know I needed to turn it. If you have lived with diabetes for some time and have just got used to 'the way things are', knowing really that this or that is not quite right, but unable to find any way forward. If your doctor seems happy enough with what you are doing, though suggests you should probably 'improve your control a bit', without ever seeming to be able to suggest any practical way to go about that (or at least none that you believe would have any effect). If this is you, as it was me, then take a look around. There are thousands of diabetic lives out there and someone will be going through what you are. Someone will have tried something that might work for you. Someone will post and answer to your forum question that will get you thinking. Someone will be there simply to offer support and understanding for the unfairness and frustration of it all. You can test this systematically, and until your basal is right everything else will be all over the shop. Your basal profile is not as flat as you have been told, and there are a number of timings and splits of dose that will work for different people. For pumpers, basal profiles are almost infinitely tweakable. Not something I learned this year, but something I was horrified to discover that others were not being taught. Utter madness. 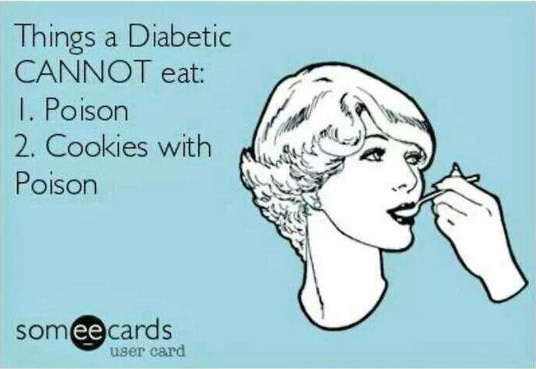 Don't be too hard on your pancreas for rather letting you down on the whole insulin production front. It's still doing all sort of useful things digestion-wise. Your liver on the other hand probably needs a good talking to. Mine has a habit of gleefully dumping glucose into my bloodstream at the most in-opportune moments (dawn phenomenon or Somogyi effect anyone?). This can make test results seem chaotic and confusing. You might have been told which carbs release slowly by a dietician. You might be eating high fibre and low fat with 'heart-healthy' starchy carbs. Unfortunately though there is no way to tell what will happen to your blood glucose levels after eating something without testing on a BG meter. And there is nothing heart-healthy about constant post-meal BG spikes. The difficulty is that everyone is different. What is fine for one person will be a BG diaster for another. There are a lot of things I had believed to be 'safe' which I have dropped from my menu this year following 1 hour and 2 hour post-meal tests. Additionally diets high in carbs seem to lead to high cholesterol levels whether they are low fat or not. Moderation, as with so many things in life, seems to be the key. Jane tells me I'm still learning this one. If you get a rubbish day/week/month of BG levels try not to beat yourself up about it. Write everything down, look for patterns, ask questions. Look online for others who have had a similar experience. Don't make changes too quickly, take your time and see if results are repeatable before you decide what you think is causing what. This is the hardest lesson of all. But I'll keep working at it. I have an annual review coming up in a few months time. I'll be very interested to see if the improvement I feel in my day-to-day diabetic experience is shown in my HbA1c level. Here's to the next 12 months of D-OC discovery. I haven't added to this blog since June and wow, what a year we have had. We have all changed. Tomorrow is the anniversary of the birth of the idea of this blog. I can't believe it's only a year, so much has happened. Ellen has become a teenager, Beth has grabbed the challenge of secondary school between the teeth and is giving it a good shake, stand back the rest of year seven, Mike has learned so much he could write a PHD, and me, well I, apparently, am allowed to be me. The children grow up and begin to take responsibility for themselves, and at the risk of sounding like Grandma Walton, I am very proud of the people they are growing in to. I don't always find it easy to stand back and let them get on with life without my valuable input; but I try very hard, and hope it will get easier the more I practice (and get told off). I have had a whole lot more time free to work and build up a career since we said goodbye to primary school and all the extra responsibilities that went with it. It will take a while to get back the confident cockiness I had before kids, about the same length of time it takes to earn an income I expect, and I am frustrated at having to be patient (not my strong point) and wait for both. It will happen. Mike, however, is the icing on my cake. I cannot emphasise enough what an important process Mike has gone through this year, and if you are in Mike's position, if you are around forty years old, have a partner, possibly a family, if you haven't already taken responsibility for your control, then do it now. Mike thought he had. He would have denied it a year ago if I had suggested otherwise, and maybe he would have been right to do so, because his control was pretty good, and certainly no one had suggested that he was doing it all wrong, or even made any particularly useful suggestions as to how he could improve; all I know is that a year ago I was a wife and a carer, and now I am just a wife. I haven't had to fight Mike to bring him round from a hypo since, maybe last April. This was something I was used to doing at least once a month and sometimes several times a week, for the fifteen years of our marriage; it never felt like I was fighting Mike, I was fighting the diabetes, but it was my fight, Mike wasn't really there, it was a responsibility I had no choice but to take on as part of our marriage. I don't like fighting. If you are about forty... however much you think it doesn't matter and that you won't go through a mid life crisis, I think you do. I will be a happy pensioner, I'm looking forward to slightly furry cheeks; but at forty, I did take a close look at my life, and what it could look like in another twenty years, and although most of what went through my head made me smile, the fighting made me feel exhausted. I know Mike has to cope with his diabetes all day everyday, and I am happy to take on some of that responsibility for him if I can, but I needed a rest, and the work Mike has done towards understanding and controlling his diabetes, has enabled him to take full responsibility for it for nearly a year now and I know that he feels better for it too. I think Mike is beginning to tame his diabetes, we all live with it, but we're not scared of it - and most of the time it's pretty well behaved.